You’ve overheard it at salons, read it online, and the term seems to be catching on everywhere..but what exactly is hard waxing? Is it better, or any different from regular soft waxing? When should you choose it? Well, read on to know all you need to on the new waxing trend that’s been doing the rounds lately! What is Hard Wax (or Hot Wax)? Hard Wax, also known as hot wax, is a substance used for hair removal that is an alternative to soft waxing (also known as strip waxing). It is also sometimes called stripless wax, since it doesn’t need any cloth strips for its removal. 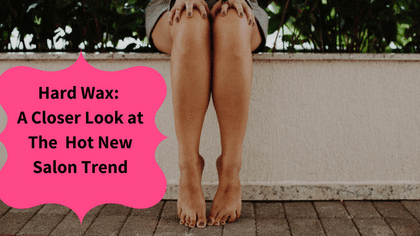 While it’s been around in use in salons for a while now, it has recently come into the spotlight, thanks to new hard wax brands promoting their products and the procedure online. This type of wax comes in the form of circular pellets, also known as hot wax beans, which have to be heated before application to make it spreadable, and is applied thickly over the skin, much thicker than soft wax. The wax then hardens within minutes as it cools, gripping the hair follicles in the process. This hardened wax is then easily removed by the aesthetician without needing any cloth or paper for it. One cool thing about hard wax is that as it cools, it also shrinks in size, literally acting like a shrink wrap around your hair. This makes sure that even the shorter or finer hair come into its grip and can be removed easily. What are hot wax beans made of? You might’ve seen photos of colourful, button-like hard wax pellets on the beauty pages of instagram – they’re so eye-catching, after all ! These are known as hot wax beans, and come in a variety of colours and fragrances. Chiefly made up of Rosin, which is a distilled form of resin found in pine trees, it is a natural substance and is solid at room temperature. This is why hard wax has to be heated before application, to make it viscous and spreadable. Many brands also add soothing ingredients such as shea butter and aloe vera into their formulation to make it gentle on your skin. How is hard wax applied? Step 1: Pre epilation oil/powder is applied over the skin. This makes sure the skin is free of sweat/dust and prepped for waxing. Step 2: The hot wax beans are warmed to the desired consistency in the wax heating machine. This liquifies the beans, making them viscous and spreadable over the skin. Step 3: The aesthetician then thickly spread the wax with a spatula over the area, in the direction of your hair. Unlike soft wax, the hard wax is applied as a thick layer, so it doesn’t harden and break as it cools! Step 5: Once the wax is firm to the touch, the aesthetician then grips a corner end of the wax, and pulls the wax in the opposite direction to your hair. Step 6: A post-epilation oil is applied to soothe the skin, and remove any wax residue that might’ve been left behind. What makes it different from soft wax? While there are many points that make it different from soft (strip) wax, if we had to tell you the biggest difference between the two, it is that while soft wax needs a piece of cloth or paper to be placed over it before it is stripped off the skin, hard wax doesn’t need that – it hardens over the skin and can be removed by hand, without needing any other material. But aside from this quality, hard wax has a lot of other characteristics that makes it different. Glimpse this easy to refer table below to see what makes these techniques different, at a glance! No strips, no mess! Since hard wax is removed by hand without needing cloth/paper strips, it saves a lot of mess and wastage of material. Since it grips the hair follicles more than the skin surface, it removes shorter hair more effectively. When compared to soft wax, hard waxing is less painful and better at removing hair in one go, making it ideal for waxing sensitive areas like the face, underarms and the bikini line. So ladies with sensitive skin, this is the way to go! As it hardens and dries up over the skin, hard wax doesn’t leave any sticky residue over the skin after removal. It is always good to know all options available when it comes to personal care routines such as waxing, to find what works best for you, and we hope we helped clear your doubts/questions you might’ve had about hard waxing! In case you have any more questions, do feel free to comment below or ask in our salon, and we will be happy to answer them for you! 6 Most Common Questions On Brazilian Wax, Answered. Of all the myriad beauty and personal care treatments us women go through, Brazilian wax is one that is often shrouded in a veil of mystery, and it’s easy to see why. This is one treatment that is focused on an area of your body that is private and sensitive – and while the process is a quick and hassle-free one in the hands of an experienced esthetician (skin care specialist), it naturally gives rise to a lot of questions in the minds of first-timers before they give it a try. Based on our extensive experience with customers, we have put together a list of answers to the most common questions that spring up in most people’s minds when they think of Brazilian waxing and have got our amazing expert estheticians answer them for you. So, read on and let us demystify this treatment for you! 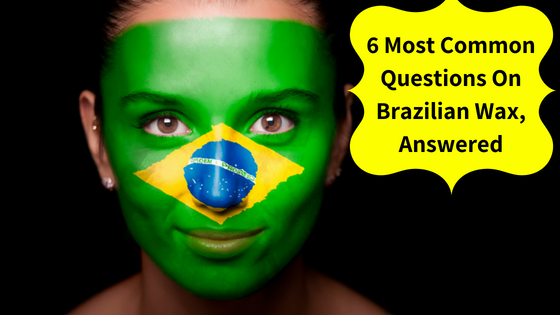 1.What exactly is Brazilian waxing? Let’s get cracking on the basics – most of us have a vague idea of what a bikini wax is, but we are not so sure what exactly is covered (or rather, uncovered!) in a Brazilian wax. While a bikini wax removes the hair to make sure the skin along the sides of your bikini is hair free (the V area along the sides that can be seen if you wear a bikini bottom), Brazilian wax goes a step further and removes the hair on the front of your pubic area (the fleshy area above your labia), your vaginal lips, and (if you want to) the hair in between your hip cheeks. Some people choose to go completely bare and remove all hair from front to back (termed ‘Hollywood’), while others prefer to keep a small vertical strip (termed ‘landing strip’), or a small triangular patch (termed ‘desert island’) , on their mons pubis – you can choose how much hair to keep or remove completely depending on your own preferences – just make sure you openly discuss this with your esthetician before you begin the procedure. This is the most common question we get asked, and we understand your anxiety! If you have ever got hair waxing done in any area of your body, you know that the process causes some discomfort at first, but with the right preparation and with an experienced esthetician, the process becomes increasingly less painful and hassle free after the very first sitting. The pain you feel in your session depends on several factors that vary from person to person. Good news is that you can control many of them to minimize the pain to a great degree (we will talk about how you can do this later in the article). 3.Is the procedure safe? How do I make sure that it is? Another important concern we see amongst women is regarding the safety of such a procedure, which is a fair question to ask, given the focus area in question. Brazilian wax is a safe and hygienic procedure in the hands of an experienced esthetician, however it is very important to do a thorough check of the salon you go to, and check up on the hygiene measures they follow to make sure that the treatment remains absolutely safe for you. 1.Ensure that the esthetician you go to is a licensed professional and operates in a sanitary environment. Check the reviews of the salon or ask your friends for recommendations. 2.Make sure beforehand that the salon follows a no double-dipping policy. The spatula is to be dipped in the wax only and only once. Dipping the same spatula in the wax pot can lead to transmission of bacteria and infection. The one dip rule is an important one, ladies! 3.Make sure your esthetician wears gloves during the procedure. It is a necessary hygiene measure. 4.Ask them if they use hard wax. It is gentler on the skin and ideal for sensitive areas, in comparison to strip wax. 5.Wax should be a comfortable temperature – not too hot. Keep an open communication with your esthetician to make sure you let her know if the wax begins to feel hotter than normal. Unlike shaving, the Brazilian waxing removes from the roots, keeping the area hair free for much longer – you won’t have to worry about your next visit for up to 4-7 weeks! While shaving or using depilatory creams can lead to your pubic skin becoming rough and the appearance of a black stubble in the area, waxing keeps the area smooth and exfoliated, minimizing the possibility of ingrown hair. One great thing about Brazilian waxing is that after the procedure, the hair that grow back are softer, finer and progressively sparser, making the pubic area naturally less hairy, and making future waxing sessions easier to handle. 5.How do I make it less painful? It is best to not schedule your waxing appointment between 5 days before, during, or till 3 days after your period. Your skin is quite sensitive during this time, so it is a good idea to wait it out and schedule your session out of these intervals. Another thing to keep in mind is that you must let your pubic hair grow back to at least 1/4th inch before your waxing session – this will make the procedure much quicker and less painful, as the longer hair are easier to remove than short ones. While your salon will have wipes and talc handy to make sure you are not sweaty during the procedure (which can lead to wax becoming difficult to remove) it is a good idea to reach the salon showered and not after an intense exercise. Use a good solution or product to avoid an ingrowing hair problem – ask your therapist for a recommendation. 6.Can I get some aftercare tips? 1.Don’t rush off to a workout afterwards: It is a good idea to avoid exercising and any activity that will case abrasion on your skin for up to 24 hours after your waxing session, to make sure that the skin gets time to recover and heal. 2.Avoid hot water/steams: It is best to avoid hot water baths and showers at least for 24 hours after a waxing session, as your skin is sensitive and vulnerable to irritation during this time. 3.Wear loose, natural clothes and fabrics: Avoid wearing synthetic materials and jeans, tight underwear, abrasive clothing for a few days after your waxing session. Allow your skin to breathe and heal. 4.Avoid regular soaps/shower gels: The chemicals in the soaps, shower gels and perfumes can be quite harsh on your pubic skin after waxing, so avoid using these for up to 24 hours after your session. Extra question – how often should I have Brazilian Wax? We recommend 4-6 week gaps between the treatments. That is the optimal time to keep the area maintained, and the treatment is way more bearable due to the length of the grown hair! With the right precautions and preparation, Brazilian waxing can be a quick, effective and hassle-free addition to your hair removal routine. Would you like to give it a try? Check out our waxing page. Got any more questions? Don’t hesitate to drop in a comment and call us, we will be happy to help!